Colonel George Goad (seated 8th from left, front row) and staff. Goad was Warden of Dorchester Penitentiary for 33 years, from 1923 to 1956. Photo taken November 4, 1926. 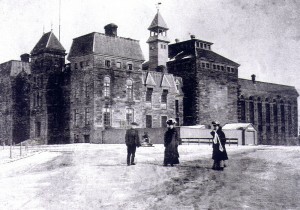 Opening in 1880, the new Maritime Penitentiary in the village of Dorchester replaced penal institutions in Saint John, Halifax and Prince Edward Island. The main prison was built of stone and contained 120 cells size 4 x 6 x 9 feet, and was surrounded by a wooden picket fence enclosing about 12 acres. The first staff consisted of 29 officers under Warden Blair Botsford. Warden Botsford was paid the princely sum of $1400 per year while the officers received $450 per year. The current exhibit is the work of one man, who saved many historical documents from the prison incinerator and articles of contraband from being consigned to the muddy Memramcook River. Byron Duffy, the prison’s personnel officer, deplored the destruction of these important artifacts and campaigned for a room in which to store his “treasures”. Warden Ulric Belanger granted his request and Canada’s first prison museum was born in the mid-1960’s and housed in the administration building. 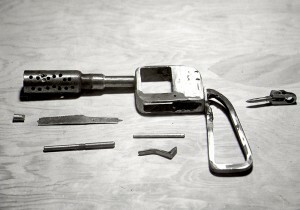 Handmade gun, conﬁscated before it could be used in an escape attempt. Now permanently located on the grounds of Keillor House Museum, this exhibit provides a fascinating glimpse into the construction of the building, daily life of the officers and inmates, illegal activities, and punishment for those who flouted the rules of prison life. Greeting you is a mannequin in a broad-brimmed stetson and simply tailored uniform of another era, wearing a hand-crafted holster once belonging to Mr. Duffy. You will view the “Whipping Table” where lashes were administered for various infractions, feel the weight of an “Oregon Boot” which prevented any attempt at escape while working outside, or try to imagine how constricted one would feel wearing a “mouth guard”. Read of the murder of a guard in the course of his duty and then examine the contraband weapons which put the lives of the officers in danger on a daily basis. For over 125 years, the grey stone walls of Dorchester Penitentiary have dominated this village and impacted on the lives of its citizens. This exhibit is an acknowledgment of that reality both inside and outside those walls.